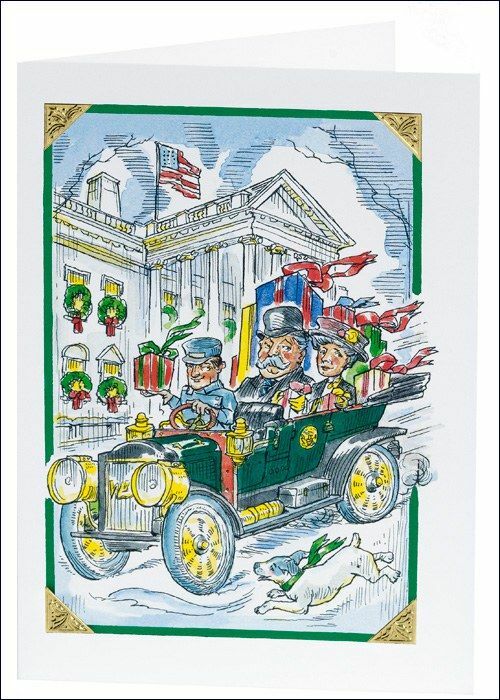 Salem College Associate Professor of Art Dr. John Hutton was chosen to design the 2012 holiday greeting cards for the White House Historical Association. Hutton's 2012 design features the 27th U.S. President, William Howard Taft, who was the first president to own and keep an automobile at the White House while in office. Hutton previously worked with the foundation, which heads preservation efforts at the White House, on the 2006 children’s book, The White House ABC. The book features each letter of the alphabet individually, with the names of the presidents and words associated with the White House listed in five languages (English, French, German, Spanish and Latin). In 2009, association commissioned Hutton to create a special edition of the book to present to President Barack Obama on the occasion of his inauguration. The cards, which retail for $17.95 for a package of 16 with envelopes, are available from the association’s catalog and also on their website. Hutton is also author and illustrator of the Sister Maus children’s book series, which is based on colonial life in the Single Sisters House on Salem’s campus. The latest in the series, Flowers for Mr. President, was released earlier this year. The books are available at the Salem Academy and College Bookstore, Old Salem Museums and Gardens gift shop and on the Salem College website.